On October 15, 2018, at approximately 10:30am the Fairfield Police Department began to receive phone calls from citizens reporting possible gunshots in the area of Travis Bl and Union Av. While officers were responding to that area another caller from the 2000 block of Hampton Place called saying that she had heard gunshots and then the front window of the residence that she was in shattered. Witnesses in the area described a possible suspect vehicle as a red Dodge Charger with tinted windows. That information was given to patrol officers. Detectives took over that investigation and began reviewing video surveillance footage in an attempt to locate the suspect vehicle. On October 16, 2018, a patrol officer in the area of Hampton Place observed a red Dodge Charger with tinted windows drive by the residence. The officer recognized the driver as Nakita Hubbard, a 23-year old male Fairfield resident, and knew that he was currently on active parole. The officer stopped the vehicle and made contact with Hubbard and two other subjects in the vehicle. During a search of the vehicle, a loaded firearm was found concealed inside. 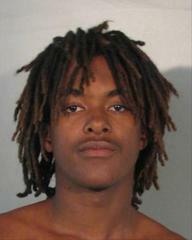 Hubbard and the other two occupants of the vehicle were detained and later questioned by Fairfield detectives. As a result of the investigation, detectives were able to determine that Hubbard had been the one responsible for shooting into the residence on Hampton Place the day prior. He was booked into the Solano County Jail on charges of shooting into an inhabited dwelling, assault with a deadly weapon, various weapons charges, and a parole violation. Anyone with information regarding the shooting on October 15, 2018, is asked to contact the Fairfield Police Department’s Investigations Bureau at (707) 428-7600, or Solano County CrimeStoppers at (707) 644-7867. You may also send the information via text message by texting TEXTFAIRFIELDPD followed by your message to 888777. Callers and texters may remain anonymous.